This holiday potholder is part of the Winter Wonderland collection by Kay Dee Designs. 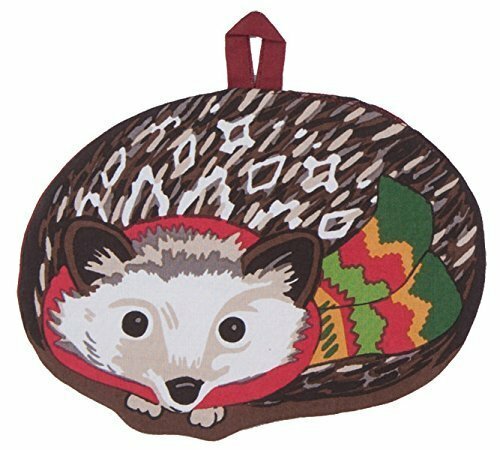 The pocket mitt has a hedgehog shape and the hedgehog print is brown, tan and white with a multi-colored scarf, while the back fabric is a reddish-brown. The pocket mitt has the pocket in back with a quilted lining; and has a reddish-brown fabric loop for hanging. Kay Dee Designs linens brings fun into the kitchen with its unique and creative kitchen linens collections. They have designs to match every home decor - from the coast, to the plains, to the south and southwest, contemporary, country and more. their collections include oven mitts, pot holders, towels and more. 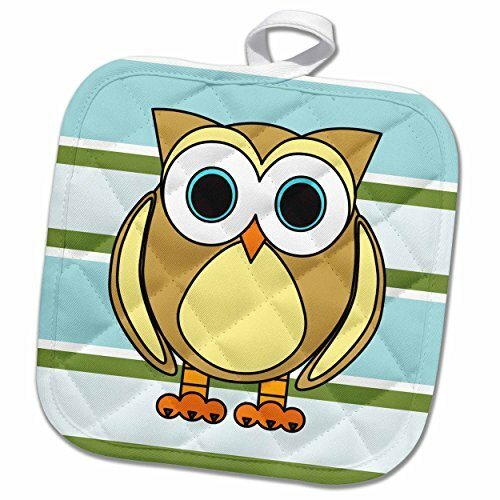 Cute Owl Blue Green Stripe Potholder is perfect for daily use, while coordinating well with any kitchen décor. This 8 by 8 inch, 50/50 cotton/polyester blend, pot holder features a quilted design which allows for more flexibility when using. Handy attached loop offers the option to hang for display or storage. Heat resistant for safely removing dishes from the oven and hot pots from the stove. Great as a hostess or housewarming gift. Check out our Special Offers and Product Promotions listed above. 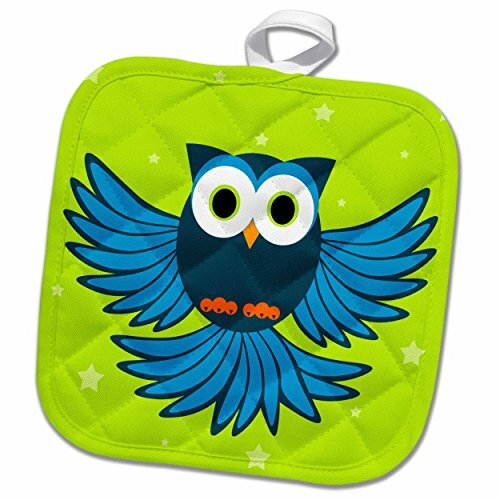 Cute Blue Flying Owl Under Stars Potholder is perfect for daily use, while coordinating well with any kitchen décor. 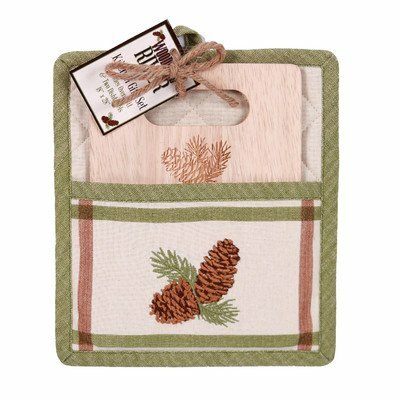 This 8 by 8 inch, 50/50 cotton/polyester blend, pot holder features a quilted design which allows for more flexibility when using. Handy attached loop offers the option to hang for display or storage. Heat resistant for safely removing dishes from the oven and hot pots from the stove. Great as a hostess or housewarming gift. Check out our Special Offers and Product Promotions listed above. 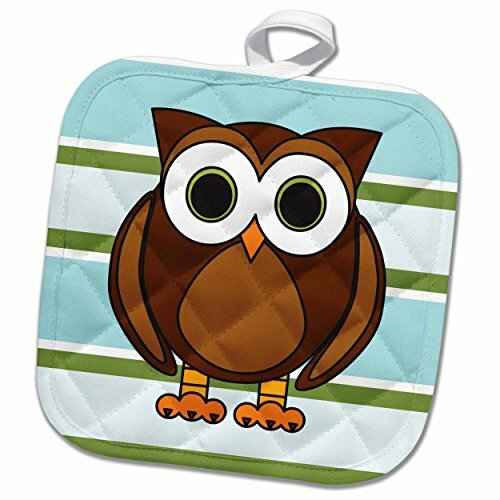 Cute Brown Owl Blue Green Stripe Potholder is perfect for daily use, while coordinating well with any kitchen décor. This 8 by 8 inch, 50/50 cotton/polyester blend, pot holder features a quilted design which allows for more flexibility when using. Handy attached loop offers the option to hang for display or storage. Heat resistant for safely removing dishes from the oven and hot pots from the stove. Great as a hostess or housewarming gift. Check out our Special Offers and Product Promotions listed above. 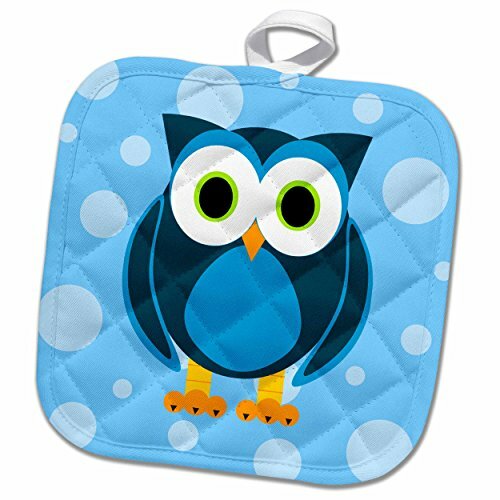 Cute Blue Owl on Light Blue Background Potholder is perfect for daily use, while coordinating well with any kitchen décor. 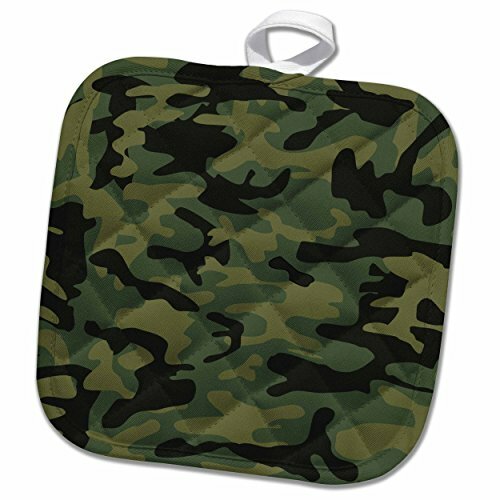 This 8 by 8 inch, 50/50 cotton/polyester blend, pot holder features a quilted design which allows for more flexibility when using. Handy attached loop offers the option to hang for display or storage. Heat resistant for safely removing dishes from the oven and hot pots from the stove. Great as a hostess or housewarming gift. Check out our Special Offers and Product Promotions listed above. 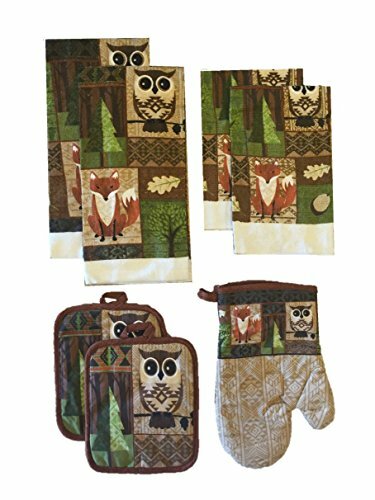 This adorable owl and fox themed kitchen set will add a touch of woodland whimsy to your kitchen decor. Set includes 7 items. 100% Cotton. Liven Up Your Countertops with the Mason Cash In the Forest Ceramic Utensils Jar Neatly store, organize and display your favorite cooking utensils with the Mason Cash In the Forest Ceramic Utensils Jar. Whether you want to declutter your countertops or add instant charm to your kitchen, this jar provides a great storage solution for small spaces. Made from fine ceramic stoneware, this utensils jar measures 6-1/2-inches in diameter by 7-inches high with a capacity of 2-3/4-quarts or 90-fluid ounces. Safe for dishwasher and microwave. Imported. Mason Cash has been producing beautiful, functional, iconic kitchenware for over 200 years. The origins of Mason Cash can be traced back to a pottery operating at Church Gresley in the heart of England during the1800's. Famed for classic kitchenware designs such as the Mason Cash mixing and pudding bowls, the products and brand have endured the test of time and have become design classics, with some maintaining their original designs. 50527 Features: -Gift set includes cutting board & oven mitt. -Woodland River collection. -Material: Wood. Material: -Wood. Use: -Meat Cutting Board/Cutting Board Set. Shape: -Rectangle. Reversible: -Yes. Meat Holding Spikes: -Yes. Number of Items Included: -2. Dimensions: Overall Width - Side to Side: -9". Overall Thickness: -3". Overall Product Weight: -0.4 lbs. Overall Length - Front to Back: -13". 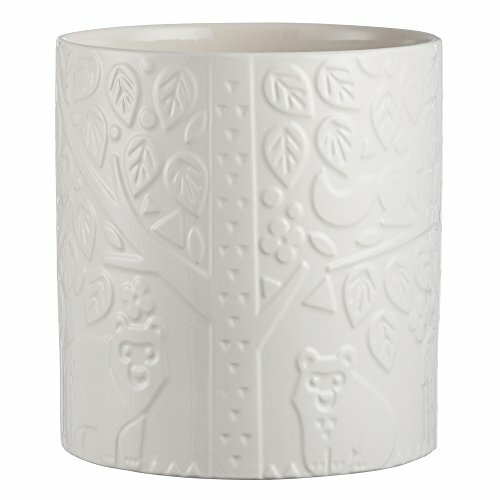 Looking for more Woodland Pot Holder similar ideas? Try to explore these searches: Luk Flywheel, Gentle Giant Mini Bust Clone, and Prescription Medications. Pour that hot liquid right from your bush pot with ease!